Zirbel denies “knowingly” ingesting DHEA. “Unknowingly” a tough sell. Zirbel "knowingly" riding his bike. “I didn’t knowingly ingest any DHEA,” said American rider Tom Zirbel after his A sample came back positive from a WADA-accredited lab at the University of Utah. So, the only remaining option is what — unknowingly? The “unknowingly” option is always a hard one for Twisted Spoke. Top riders scrutinize every facet of their training including a near religious focus on their diet. They weigh their food, they count every calorie and obsess about the benefits of each bite. They’re maniacally careful about what they put in their bodies. Unknowingly is just hard to swallow. In Zibel’s case, the unknowing excuse is doubly hard to accept. He claims, “I’m ignorant about these things, I didn’t know what DHEA was until I was first notified about my A sample.” These days any rider with half a brain has a basic understanding of what is and isn’t on the banned substance list. A steroid like DHEA is in screaming capital letters that are hard to miss. It’s the same multi-function steroid that ended Tyler Hamilton’s career. But the most damning unknowing is when Zirbil goes into further detail about hiring an expert to oversee the handling of his B sample. He said, “I have a chemistry back ground so I thought I could check things out as well.” Having a working knowledge of chemistry makes the unknowingly argument even more difficult to believe. The man is a dedicated professional athlete with an interest in chemistry in a sport with a pervasive and public doping problem and he’s never heard of DHEA? That puts quite a strain on credulity. If this weren’t what seems like the 100th rider in the last 10 years to plead ignorance about a positive doping test result, we could perhaps say, yeah, maybe, somebody in a white lab coat messed up. It happens, everybody makes mistakes. The newspapers are filled with cautionary tales of botched procedures and medical malpractice horror stories. It would be a tremendous misfortune and gross injustice if Tom Zirbel is innocent. 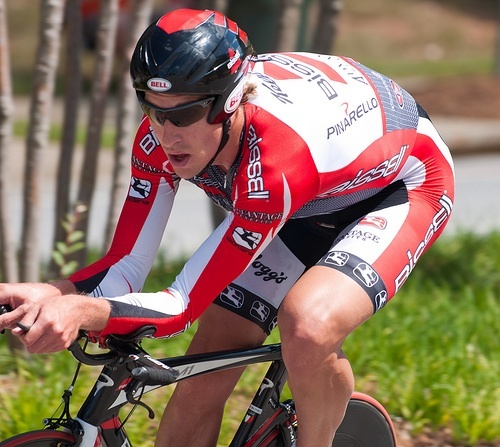 He finished second to Dave Zabriskie twice at the USA time Trial championships. He had a new contract with Garmin-Transitions for the 2010 season. His results are now questioned, contract terminated, career hanging in the balance. There’s lot of undoing in the unknowing. Sadly, it seems to Twisted Spoke that Zirbel has unknowingly repeated the same sad, ignominious mistake as many riders before him. We look forward to writing a full retraction and apology to Zirbel should his B sample come back negative. In the meantime, we’ll just say, welcome to retirement, Tom. « Prudhomme says Tour de France start in Qatar possible. The podium girl shortage. Twisted Spoke, Take note that everybody who knows Tom Zirbel is coming down on the other side of this issue from you. It’s more than just a “buddy pal” thing–it’s about integrity. Do you have any wise thoughts about why this process is taking so long? Keep working on your retraction and apology, and even though we all know there is no such thing, don’t buy any “stock” in the USADA. Hi Delilahdriver, thanks for taking the time to write. A few things: I didn’t know much about Tom Zirbel before his A sample. Since then I’ve read a few things about him including checking in on his blog. He seems like a cool, smart, fun and positive guy. Plus, he’s a real tall guy like me, so that makes me want to support him. I think I covered that a bit in my second Zirbel post, if you missed it. That said, I doubt there’s some sort of conspiracy in “the process” you mention. Even Joe Papp, popped for doping, said the USADA is fair and professional. Nobody wants to ruin Zirbel’s career and that probably explains the extra time the lab is taking. You’d also have to admit that most failed A and B tests are accurate and those riders doped. So if Zirbel mistakenly or unknowingly took something in a supplement, that would be a terrible thing. But again, there’s been at least 10 years for athletes to realize that supplements are mislabeled. So for a pro athlete with a science background in a sport with a serious and on-going doping problem to not pay close attention to to what he puts in his body, well, that’s not easy to believe and unwise on his part. I can appreciate the pains and suffering Zirbel is going through especially after reading how devastating it was for Joe Papp. It would thrill me to write a retraction and I look forward to writing it. Walshworld,do you know of a practical way to know with 100% certainty what is in the food and drinks you put into your body? Please don’t say “read the label” because labels can only tell us what is “supposed” to be in there. Labels were probably not made at the same place, or even the same month as the product they are afixed to. I don’t know if tainted supplements are the cause, or if maybe the Utah test was botched (TEN weeks between the urine sample and the Positive A notification),or Tom’s state of extreme dehydration on August 29th, a combination of the above, or some other cause that does not occur to us. Yes, Walshworld, Tom has said that the USADA was very professional when he was with them at the lab in Utah. How precisely and reliably these tests are done will be very crucial. They may shed light on this story. That is something that the supporters of Tom want very much–lots and lots of bright light to be shed on this story. Welcome back, Delilahdriver. There’s not such thing as 100% certainty in anything. I don’t worry about traces of something illegal in my protein powder that’s not on the label. There’s no repercussions — I’m not a pro athlete. But I’m assuming for riders who want to be sure they’re on the safe side of a doping test, they better be in the high 90’s. Two years is a long vacation from something you love that pays you well. Joe Papp, a rider who tested positive for EPO, passed me WADA’s code of Strict Liability. Note the 100% mention. It means unfortunately that athletes just can’t claim “unknowingly” or say, as Tom ZIrbel did, “I’m ignorant about these things, I didn’t know what DHEA was until I was first notified about my A sample positive.” Guilty or not guilty, those are not good answers. The onus of responsibility is on the rider, not the people writing the supplement labels. As I said, Tom seems like a cool guy and lab mistakes happen but his answers so far seem questionable. Walshworld, you wrote: “Top riders scrutinize every facet of their training including a near religious focus on their diet. They weigh their food, they count every calorie and obsess about the benefits of each bite. They’re maniacally careful about what they put in their bodies.”—HOGWASH, THEY’RE NOT FASHION MODELS. Have you ever sat down to a post-race or post-training-ride meal with Pro Cyclists? Well, I have,and you’d better watch your fingers because they ANNIHILATE everything on the table, buddy. They all have high performance engines that need lots of fuel, and when they get to the table, they gas up. “weigh their food-count every calorie-obsess about the benefits of each bite”-You made that up didn’t you?–what a joke-people read this stuff, and some of them believe you, so try to get it right-Who’s a Dope, meaning clueless? Okay, now I see your evil plot: you’re simply going to wear me down, right? You’re an endurance writer, aren’t you, Delilahdriver? I’m going to make a suggestion because I think I’ve found your calling. Your friend Tom Zirbel needs an organized group of supporters in his legal case. Something like Fairness for Floyd. I nominate you as president of Zealots for Zirbel. Go for it.